ProfTweak 1.4 now supports Makerbot Desktop. It also fixes a bug in ProftTweak v1.2 and v1.3 that can cause bad profiles (update now!). I’m a big fan of MakerWare and the MakerBot slicer. The recent improvements in rafts, supports and general slicing quality are impressive. That said – the one thing it doesn’t do is provide a UI to access all the juicy goodies that let you really tweak print quality and get good results with alternative filaments. Further – I often want to take an existing profile – and change a single variable as an experiment. For example – I might have a profile for Nylon that works well – but I want to try boosting the temperature up to 255c (and not have to create a new profile or risk messing-up the one that already works well). Source and binaries (Windows, Mac, Linux) for ProfTweak are available on GitHub. Tip: Look for the “Download Zip” button to quickly grab everything. ProfTweak was written in Processing using the G4P GUI library (these are great resources – but next app I will probably try something not Java-based). ProfTweak requires Java (32-bit). If ProfTweak won’t run – you may need to install it. ProfTweak is licensed under http://creativecommons.org/licenses/by-sa/3.0/. I’ve tested ProfTweak – and it seems to work for me. But there may be bugs – awful bugs! I can’t say with certainty it won’t do something terrible to your brand-new Replicator 2x. Don’t bug the nice people at MakerBot support about issues you encounter while using profiles generated by ProfTweak. ProfTweak requires an existing custom profile to start with. You might want to create an unadulterated custom profile from inside MakerWare based on the “Standard” (and maybe “Low” / “High”) to base future profiles on. 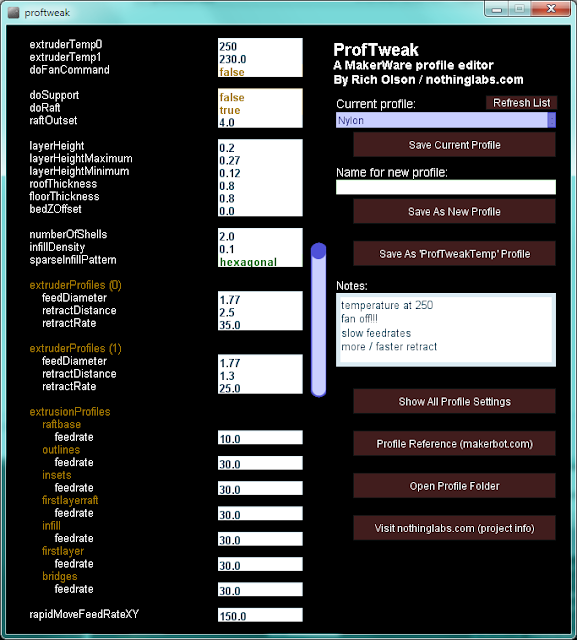 ProfTweak won’t modify the built-in MakerWare profiles. When you create a new profile from within ProfTweak it copies the supporting files (end.gcode, start.gcode, profile.json) to a new folder – as well as writing out a new miracle.json file based on your modifications. ProfTweak stores its settings in proftweak.json found in the DATA folder under the folder where the app is installed. ProfTweak should generally find your MakerWare profile folder – but if it doesn’t – you can specify it manually in proftweak.json (Linux users will probably need to do this). If you want to add / remove common items you can do so by modifying proftweak.json. Mac users – if you get an error “proftweak.app is damaged and can’t be opened” – it’s likely due to your Gatekeeper settings requiring apps be signed. See here for the solution. If you associate .json files with ProfTweak – MakerWare will launch it automatically when you select “Edit profile.” The Windows setup package can do this for you automatically. ProfTweak reformats the .json in any profile it edits. This makes it less human-readable (MakerWare seems OK with it). When you modify a number – ProfTweak deals with it as a float. As a result .15 becomes 0.15000000596046448. This shouldn’t make a meaningful difference when slicing – but it might make a small one. Saving in ProfTweak is always a manual operation. If you close without saving – you’ve closed without saving! Have fun!!! Don’t hesitate to contact me (rich@nothinglabs.com) about issues. What field do I change to set the infill to honeycomb? Also… you rock my world! Thanks heaps. This is great. I have a problem that I can't set different temperatures for the dual extruder. Can we do that with ProfTweak? I'm trying to install proftweak on my mac. When I open it I get "proftweak.app is damaged and can't be opened. You should move it to the trash". I already changed the permissions for JavaApplicationStub (chmod per readme) but it didn't help. Any suggestions? Thanks! Let me know if it works – and I'll mention it in the docs. That did it. Thanks Rich! This app make life so much easier, thank you. One question I would like to print my first layer as a higher temp than the rest of the build, helps the PLA stick. It says under first layer setting temperature_disabled, how do I enable that, I know I can change it manually on the rep2 panel, would be good if I could do it automatically. proftweak just exposes values from the existing setting from miracle.json. It sounds like the setting you're looking for is renamed to "_disabled" in the existing miracle.json file. I would edit the file for that profile manually – and rename temperate_disabled to just "temperature.' You should then be able to set it via proftweak. Note – I don't have any clue if that setting is disabled for some good reason – so proceed with caution! Glad proftweak is a useful tool for you – have fun! nice and useful application, thanks. Is it really possible to set different temps during the print. The time between the different layers is so quick that the cooling or warming can never follow the printer speed. Getting error "Windows cannot find javaw.exe." Also getting "Error calling ShellExecuteEx()"
Used this fine before. New computer, new install of Win7 x64. Installed Java JDK, no change. This is the 3rd time writing this as your comment system likes to delete messages. Wonder how many other people couldn't comment. Hi – I'm having an issue where when I open proftweak I get a blank dialogbox/page. I've reinstalled proftweak and updated java but its still happening. This occurs both when I edit a profile from within makerware or open proftweak from the start menu or double click on a json file. Oddly if I minimise and restore the proftweak window I can then view the settings correctly. I don't – I haven't seen that one in the wild. I just released v1.4 with some important bug fixes – couldn't hurt to get the latest. When I run the exe in the windows32 folder it opens the proftweak profile editor but I can't change anything. Have you created a custom profile in makerware already? (You need to first). When you say can't change – are things grayed out? Will it not save? Is it possible to set different speed for each extruder for dual extruders printer. It seems the profile editor allows to set temperatures, but all others parameters seems shared. would be great too to have infill density for each extruder . Does not seam to run under java 8? Go to usersnamemythingsprofiles rightklick a 'json' file and open with proftweak. ('always open with this' ticked). Yes, this worked for me, but I had to add “_45” to the PATH string because that’s what it is now. Just a comment regarding the installation and something to add to the readme. The install script requires that you modify two lines in the files section to point to the source files. The two lines to modify are of the format below and require an absolute path be given. I’ve kind of stopped keeping the various installers up-to-date. Partially due to lazyness – but also thinking if people are comfortable messing with Makerware profiles – not as worried if they can copy a .exe file someplace reasonable.